« Wealthtrack: David Rosenberg – are we in a depression? 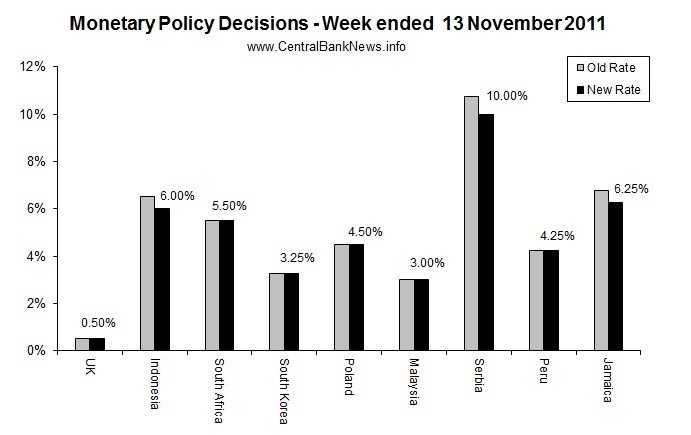 The past week in monetary policy saw interest rate decisions announced by 9 central banks around the world. Of those that changed interest rates (all dropping rates) were: Indonesia -50bps to 6.00%, Serbia -75bps to 10.00%, and Jamaica -50bps to 6.25%. Meanwhile those that held interest rates unchanged were: The UK 0.50%, South Africa 5.50%, South Korea 3.25%, Poland 4.50%, Malaysia 3.00%, and Peru 4.25%. Some of the key themes and trends emerging through the week included an increasing bias towards easing monetary policy settings. Indonesia surprised the markets with a 50 basis point cut in its rate, Serbia did likewise, as the external risks and slowing global growth has put pressure on central banks to put in place preventative measures to support their economies. For other central banks the already loose monetary policy settings, and inflationary pressures have been among the only things stopping a wider adoption of emergency/preventative policy loosening and stimulus measures. Looking at the central bank calendar, of the major central banks, next week there’s just the Bank of Japan scheduled to meet to review monetary policy settings. Elsewhere, the Reserve Bank of Australia will release the minutes on Tuesday of its last meeting where it cut rates 25bps. JPY – Japan (Bank of Japan) expected to hold at 0-0.10% on the 16th of Nov. Source: Central Bank News, November 12, 2011.